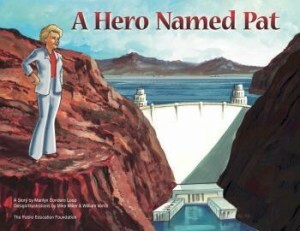 In 2009, the Public Education Foundation issued a children’s book honoring Southern Nevada Water Authority general manager Pat Mulroy. The comical, faintly Soviet-style propaganda aside, she’s that respected in Las Vegas. The last post was dedicated to jumping all over a High Country News article that UCLA journalist in residence Jon Christensen wrote about Los Angeles and sustainability, particularly LA and water. This post is to agree so completely with Christensen’s portion of a new column in LA Observed that we might appear to be tag-teaming Los Angeles Mayor Eric Garcetti. Were it in our powers, Christensen and I would appoint Pat Mulroy as new general manager of the Los Angeles Department of Water & Power. Christensen spots two stars aligning: One has Southern Nevada Water Authority general manager Pat Mulroy stepping down from her post in Las Vegas next month while the other has the leadership of the Los Angeles Department of Water & Power opening up at the same time. The first woman general manager of the Las Vegas Valley Water District and founder of the Southern Nevada Water Authority kept the hottest part of the driest state in the nation in water as the city quadrupled in size during the last two decades. She did this as the Colorado River, source of 90% of the fresh water for Las Vegas, dried up by half. She knows groundwater banking. She knows trades. Granted, she’s backward at indoor conservation, which she rationalizes by saying that Vegas gets credits for the amount of treated sewage water it returns to Lake Mead. This weakness, both in logic and practice, has plenty compensating for it. Engineers at LADWP and its overarching regional authority, the Metropolitan Water District of Southern California, are already good at indoor conservation and only likely to get better as we head toward a toilet-to-tap world. They are so proud of their record retrofitting the region with low flow toilets in private homes that they now hold press conferences to debut efficient urinals in public places. Rather, LADWP and MWD need Pat Mulroy because she is aces at cutting outdoor water waste — and most of Southern California stinks at this. Meanwhile, in Las Vegas, Mulroy’s landscape reform programs have led to turf being pulled out of what she calls “the damn dumbest places” such as highway medians and parkways. 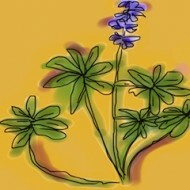 She helped to build a network of nurseries supplying landscape-worthy desert plants. 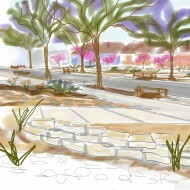 Xeriscaping is now standard in new construction. Apart from the record of Denver Water manager Chips Barry, Mulroy’s record on landscape reform is unrivaled. Alas, Mr Barry regrets he’s unable to lunch today. He’s dead. If you’re wondering if this is an endorsement of Mulroy’s bid to mine the groundwater of five Great Basin valleys for Las Vegas, the answer is “no.” That ongoing effort to drive a pipeline 200 miles north of Las Vegas to the foot of the Great Basin National Park, a scheme that is currently making a long and expensive commute between approval by politicians and agencies and invalidation by courts, is what earned her the wicked witch moniker in just about every part of Nevada outside of Clark County. It would be interesting to hear how and if her rationalizations for the Great Basin pipeline changed if she moved to LA and could no longer wave off the environmental and financial costs left by LADWP’s draining of Owens Lake, then the mining of Inyo County groundwater. It’s only fair to point out her flaws and weaknesses. She plays hardball as if there were no rule book, or it was written for her by her many lobbyists and lawyers. Though she’d have a lot of influence at MWD, greater So Cal policy on the Sacramento-San Joaquin River Delta might not shift. I can see the Coastal Commission popping rivets given how fiercely her parched gaze has been fixed on desalination possibilities of the Pacific. Her respect for and understanding of agriculture is risible. It’s unlikely that the folks in Imperial Valley care for her, given the Southern Nevada Colorado River Commission’s history of staging bus tours expressly to point to them as paragons of waste. But this is written because, to my eye, the woman who built Southern Nevada’s modern infrastructure is the best equipped water manager to find funding for long deferred maintenance on LA’s aging water mains, dry out our gutters running daily with irrigation over-spill, and to turn around the insanity that is Southern California lawn culture. Jon Christensen, thank you for the LAO posting. To learn more about Mulroy’s past in Nevada, click here. Pat Mulroy has a reputation as one of the most vile water managers in the western US because of her actions, words and behavior. At an early water conservation conference (1990) in Las Vegas she told Amory Lovins (during a panel discussion about the benefits of efficient water use) that she didn’t care about the rest of the west or the environment and that Las Vegas would never reduce it’s water use. She only started supporting water use efficiency when Las Vegas teetered on the edge of a severe water shortage. She still cares nothing about the environment as her water grab from rural Nevada clearly demonstrates. I think there are water managers who actually care about balance, education and the good of all. Don’t invite a devil into your house because the damage will destroy your way of life. Larry, Thanks for the comment. You are spot on about Mrs Mulroy’s change of heart about conservation — it wasn’t from a moral place but a response to an emergency. And I agree that there are water managers who care about balance between the environment and their utility’s needs as well. We had one — twice — in the form of David Freeman. However, I wrote this precisely because our way of life in LA needs managed deconstruction, not destruction. And I see her as capable of leading that. We don’t seriously tackle the massive problem of lawn culture because, among many reasons, we treat urban, dry-season run-off as a savings account. This account, maintained at the drastic expense of the water sources that have long been drained by LA and other cities across Southern California, can then be tapped into during droughts. I see Mulroy as having the seniority and record on outdoor conservation to tackle that policy. We need to adjust to less water, then learn to manage that water in systematic ways. I call on her because she understands the issues and is the best poised to take on lawn culture and its daily cost of turning expensive fresh water into highly polluted urban run-off. As usual, I’ll remind everyone the higher prices are the fastest driver of water conservation, whether than come from shorter showers or dead lawns. Dump LA’s obnoxious water budgets (more water for big lots) and you’d see a revolution without a leader. Mulroy’s command and control antics may work for pipes into others’ water, but she’s failed to do anything useful for “normal folks” in Vegas. LA could do better. Emily – good comment. One of Ms. Mulroy’s failings however is that she never considered limiting growth. For her growth is good and if Las Vegas needs to destroy rural Nevada so be it. David – good comment. Price signals only work for the 99 percent. The Montecito Water District (Santa Barbara County) has many one percenters paying more than $8,000 a MONTH for water and there appears to be no limit to what they will pay for green lawns. Unfortunately they are about to run out of water and all that money can’t make more water. Sometimes limits are all that work.